News - Production Magazine Interviews Metric Machining. Production Magazine recently interviewed David Parker, CEO of Metric Machining. The hardcopy article will be published in the October issue of Production Machining. Metric Machining, Inc. manufactures precision machined parts for various applications in the aerospace, automotive, commercial, irrigation, trucking and HVAC markets. Founded in 1973 by Richard and Joan Parker, Metric was originally located in Monrovia, California and later relocated to Ontario, California. The company prides itself on producing quality products and providing excellent value to its customers. Over the past few years, Metric reshaped and refocused itself to better serve its customers and employees. When David Parker was hired by the board of directors as the president and CEO of Metric Machining two years ago, the old “Metric way” of operating was no longer benefiting the manufacturer and its employees. “The biggest thing was empowering the employees. It needed to become ‘us’ at Metric instead of ‘us and them,’” said David Parker. Metric’s departments and management had been operating mostly independent from each other, without the internal teamwork that the company required. Parker cited his first holiday cookout at Metric as a sign of how things used to be. “I was walking around taking pictures, and found little groups of people from different departments scattered around and separated. Fast forward to last December and a new management team, everyone in the company sat as one big family at the table for the holiday event.” Under new upper management, the focus at Metric changed to increase support and knowledge sharing across departments. Previously, the employees did their own jobs and did not collaborate with each other. 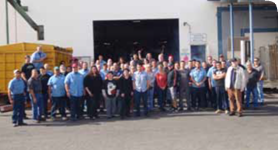 “We had to break down those barriers and move things around so that the engineers can support the shop or work with the sales staff more about solving customer problems for example,” said Parker.